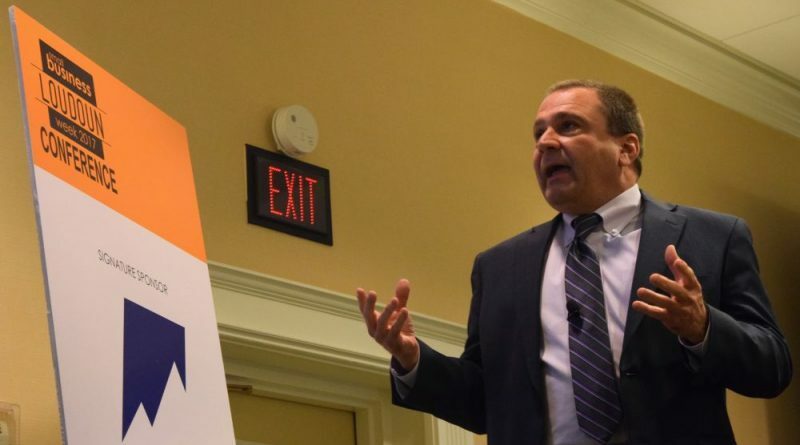 More than 125 entrepreneurs from Loudoun’s small business community met at the Dulles Marriot Hotel Monday for expert-led discussions on fostering business growth. The event kicked off the Small Business Development Center’s sixth annual Loudoun Small Business Week, but this is the first year that the center hosted this daylong conference. “We got a really good mix of people new to the journey and people who have been in business a while” said Eric Byrd, manager of the center’s Leesburg branch. He also noted the receptivity and enthusiasm of conference-goers. Attendees spent the morning and afternoon in their choice of breakout sessions offering panel discussions and presentations on a range of topics, from incorporating financial statement analysis into decision-making to lessons on behaving like a CEO. Kristine Jacobson, CEO of Conveyance Marketing Group, delivered a presentation about maximizing return-on-investment from a slim marketing budget. Small businesses typically spend a significantly larger portion of their budget on marketing than larger firms do, and the interest in Jacobson’s topic was reflected in the crowded room of more than 25 entrepreneurs, ranging from gymnastic instructors to hedge fund managers. Jacobson warned against “throwing away marketing dollars” on impersonal, broad ads, and cautioned against unpreparedly wading into the “black magic” of search engine optimization. She recommended sign-up email advertisements as a tried-and-true marketing tactic and emphasized specifically knowing the customer to whom you’re trying to appeal. “If I know them, I can usually sell them” she told the crowd. “I could do this for two hours,” said one conference-goer as Jacobson concluded her breakout session to keep the conference on schedule. Craig Rhinehart, a senior-level executive at IBM, delivered the lunch keynote address. His talk, “How the New Era of Computing Will Change Every Business…and What to do About It,” focused specifically on cognitive computing, which replicates the human thought process in computers. He displayed a list of industries that will experience structural unemployment because of innovation in artificial intelligence. The hit list included major fields such as healthcare, education services, maintenance, retail and accounting. Innovation in AI also has immeasurable upsides. Rhinehart offered the lighthearted example of Grush, an interactive gaming toothbrush that measures how well children brush their teeth with trackable results, and provides games that coordinate the toothbrush with a smartphone app. “Now kids want to brush their teeth because they want to slay the dragon or whatever,” Rhinehart said. After Rhinehart’s presentation, the afternoon had more breakout sessions and the evening concluded with a resource fair reception in the main ballroom. Loudoun Small Business Week has events around the county every day this week. For details go to loudounsmallbiz.org/calendar/small-business-week. John Patterson is a summer intern with Loudoun Now. He is studying English and economics at University of Virginia.